Bong Joon Ho has never been a particularly subtle film director, but he’s always had a rare ability to infuse his films with political messages whilst never losing sight of forging a connection with his audiences. His 2006 film The Host, is a prime example of this, blending a highly entertaining monster movie with an emotional family drama and a pretty angry attack on the irresponsible way we treat our environment. Ten years later Bong is back with a slightly similar tale, but this time the creature at the film’s centre is not treated as a threat but as a friend – bringing to mind Miyazaki’s wonderful Totoro at times – and the political underpinning of the film is one that takes aim at the barbarism of eating meat and the toxicity of modern corporate culture. Tilda Swinton stars as Lucy Mirando, the CEO of a former agrochemical company with a seriously bad reputation. She intends to turn all this around with a new business venture: a cheap, sustainable and GMO-free food source to feed the world. This source is a newly discovered ‘super-pig’ that will be farmed to be eaten. Scattering 25 of these pigs across the world, Lucy launches a competition to see who can breed the greatest super pig, to be judged by television personality Dr. Johnny Wilcox – an obnoxious sort of Steve Irwin type figure played with wild abandon by Jake Gyllenhaal. South Korea’s super pig goes to a farmer and his grand daughter, who live in a remote and picturesque location. The young girl, Mija – a surely star making performance from An Seo Hyun – is something of a free spirit and wanders the nearby forests with Okja, their adopted super pig. Bong uses these early scenes with Mija and Okja to show us the bond between the two, but also to develop a bond between them and the audience, a relationship that he, working from a script co-written Jon Ronson, then develops and uses to highly effective dramatic effect when the pair are separated and Okja and the many other super pigs’ fates become clear. 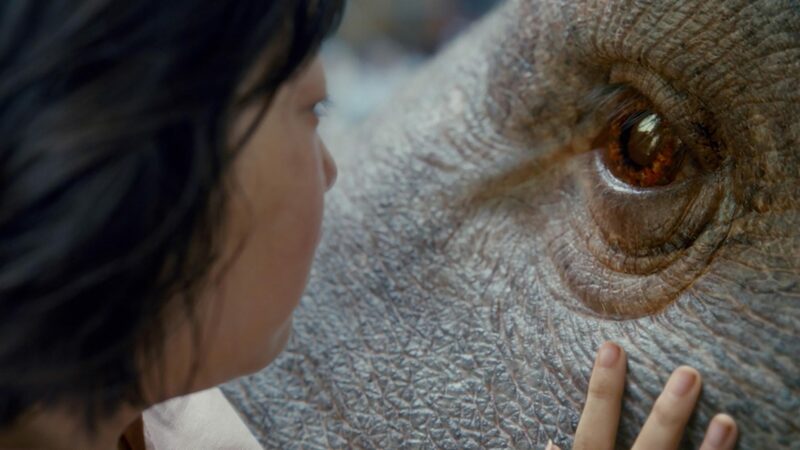 Okja is a gentle and sweet creature and an early sequence sees her not only save Mija, but risk sacrificing her own life in the process – it’s a wonderfully neat way of pulling an audience in to engage with Okja as many would with a beloved pet rather than the way in which people seem to see animals bred for meat. The difference in the way people think about animals in these two contradictory ways is a startlingly bizarre and utterly arbitrary disconnect that is so rarely discussed and one that Bong does an excellent job in highlighting. Also thrown into the mix is Paul Dano as the charming, but slightly off-kilter leader of the Animal Liberation Front (A.L.F), who are somewhat reminiscent of the ramshackle band in Frank, which was also written by Jon Ronson. Dano has a tendency to gnaw on the scenery a little and he doesn’t break from that trend here, but this is a film with big performances, with a capital B, with Gyllenhaal being perhaps the most uninhibited of them all. Almost bringing to mind Sharlto Copley’s ‘experiments in big acting’ at times, Gyllenhaal plays Wilcox with extreme vocal modulations and a looseness to his body movements that is often (deliberately) hilarious and never, ever boring. In many other films his performance would definitely be seen as ‘too much’, but Bong’s world is a bright and wild one and it’s entirely in keeping with a film that keeps you on its toes with it’s wild tangents and bold gear shifts. Whilst some of the further reaches of Okja’s wild abandon don’t always feel smoothly part of the whole, it’s a very small price to pay for the almost anarchic joy that is often on screen. Okja is a wonderfully entertaining, thrilling, hilarious and heartbreaking adventure movie with broad appeal, a warm centre and an important message. This entry was posted in Reviews and tagged Action, Adventure, Drama on May 19, 2017 by Craig Skinner. What kind of grain alcohol do you use? Brand ect..